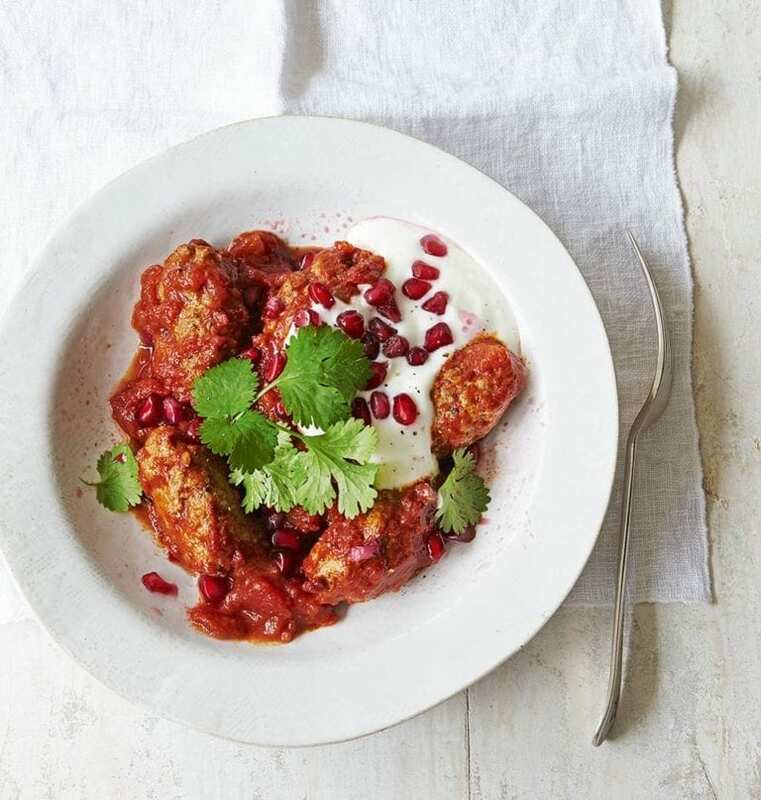 A quick, easy midweek meal made with lamb meatballs and fragrant with Moroccan spices. Crush the cumin and fennel seeds in a pestle and mortar. Season the lamb with salt and pepper, stir through the crushed seeds, then roll into 20 even-size balls (kofte). Heat a splash of olive oil in a heavy-based frying pan over a medium heat. Fry the kofte for 4 minutes, turning occasionally, or until browned all over. Remove from the pan and drain on kitchen paper. Pour in the chopped tomatoes with the red wine, cinnamon and paprika. Season lightly, then simmer for 20 minutes or until the sauce thickens, adding 150ml freshly boiled water after 10 minutes. Return the kofte to the pan, gently coating with sauce, and cook for 5 minutes or until heated through. Serve in bowls with dollops of yogurt, pomegranate seeds and a sprinkling of coriander leaves. Make smaller kofte and mix with a tin of chickpeas, rinsed, with an extra tin of tomatoes. Serve with rice. I will definitely be making this recipe again! Love the way the flavour from frying the meatballs goes in to the rich, spiced tomato sauce. I made the coriander flatbreads from the website to serve with this and they were great too.